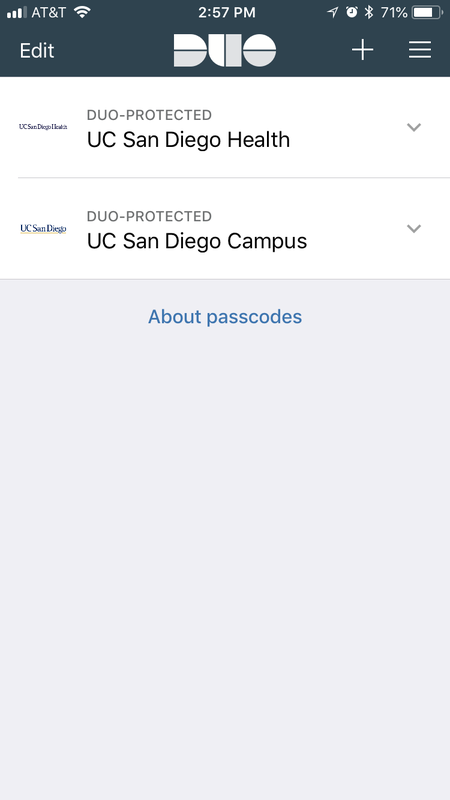 What you need to know if you use Duo for two-step login at UC San Diego Health or another institution. Faculty with appointments at multiple institutions. UC San Diego personnel accessing UC Office of the President systems protected by UCOP SSO or active directory, including files and systems related to our local implementation of UCPath. 1. You will need to register your device(s) using the process described herein. You will also have to separately manage your devices and preferences through the institution’s interface. 2. You will NOT need to download the app a second time. Once you’ve scanned the QR code, you’ll see all the institutions with which you’ve registered.